Hope you're in the mood for a cocktail tonight because this Harry Potter-themed drink is too cool to pass up. 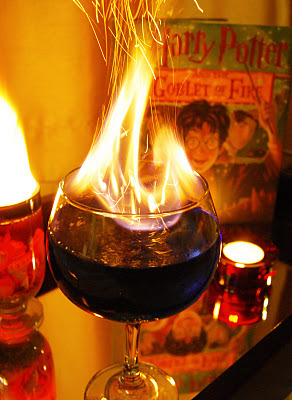 I haven't had a chance to try a Goblet of Fire but the special effects involved in this citrus flavored mixture from The Little Pink Blog sound awesome. Pour vodka, blue curacao, and lemonade into a goblet made with tempered glass. Top with a splash of Bacardi 151 rum. * Carefully light the liquor on fire using a long stemmed match or a candle lighter. Add a tiny pinch of cinnamon to the flames. The spice will cause sparks as seen in the above photo. Blow out the flames before consuming. Thanks to S4 reader Jason for the tip! *I'm guessing you'll want to make sure to float the rum on top of the drink because that'll most likely be what's catching on fire. Can't wait to try this with my fellow Potter-files!